In a bold move, Daesh (i.e. ISIL or ISIS) fighters moved Monday on Kirkuk and Erbil, two cities patrolled by the Iraqi Kurdistan paramilitary, the Peshmerga (those who stand before death). Erbil is the capital of Iraqi Kurdistan. Kirkuk is an oil city and is disputed among Turkmen, Arabs and Kurds. If Daesh, based in Syria’s al Raqqah and in Iraq’s Mosul, could capture Kirkuk, it would gain a major source of oil income. Daesh fighters were repelled, and some number killed, by the oddest coalition you’d ever want to see. The Kurdistan Peshmerga took the lead in defending Kurdistan, but they were joined by Iraqi government security forces and by Shiite militiamen who came up from the south. These forces were given close air support by the US Air Force. Kurdish commanders announced that they had regained control of Kirkuk and had chased away the Daesh fighters. The Peshmerga were aided in a number of battles by the Arab Shiite militiamen, recalling their coalition at Amerli, last fall. 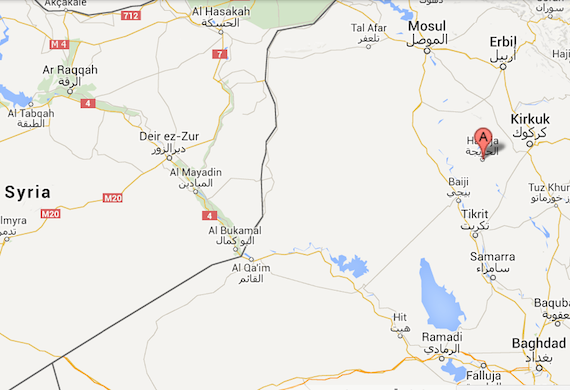 They had also collaborated in Diyala Province more recently. Kurdistan President Massoud Barzani visited the front and stressed that any force willing to fight alongside the Peshmerga against Daesh is welcome. Daesh fighters also tried to take villages near Erbil, the captial of Iraqi Kurdistan. They were repelled with the additional help of US fighter jets. Dozens died in this fighting. The cooperation achieved between the Shiite “popular forces” militias and the Peshmerga may not have been unprecedented, but it did refute observers who had predicted an Arab-Kurdish fight. Kirkuk has an Arab population, including some Shiites, along with Turkmen Shiites– who contest Kurdish insistence on annexing it to Kurdistan. Barzani appears to have earlier been threatened by the Shiite paramilitaries’ approach. He warned that he would not let them come into Kirkuk. His warning was in part a reply to the leader of the extremist Shiite militia, the League of the Righteous (Asa’ib Ahl al-Haqq), who had complained of the “Kurdishization” of Kirkuk. Hadi al-Ameri, head of the Badr Corps, another Shiite militia, also pledged to come into Kirkuk. The largely Shiite Iraqi army deserted its posts in Kirkuk last June, leaving the Peshmerga (who had conducted joint patrols with the army) in charge of the oil city. The Shiite militias appeared to wish to replace the Iraqi troops, laying down a marker on Arab interest in Kirkuk, which has de facto been annexed by Kurdistan. As Daesh approached, Barzani abruptly changed his tune and welcomed the Shiite militias with open arms. (It is not impossible that Iran played a behind the scenes role in getting Barzani and the Shiites to make up. Iran supports both Iraqi Kurdistan and the Shiite militias. This tension tells us two things. 1) The potential for further Kurdish-Shiite tension is there. And, 2), both sides are for the moment pragmatic enough to bury the hatchet in the breast of their common foe.